Blockchain technology is set to completely revolutionise how humans take up any transaction and is expected to impact every sector including banking, government, industry, education, healthcare and others. Governments around the globe are in immediate need of secure and authentic information exchange system. What are the practical applications? Join us to find out! 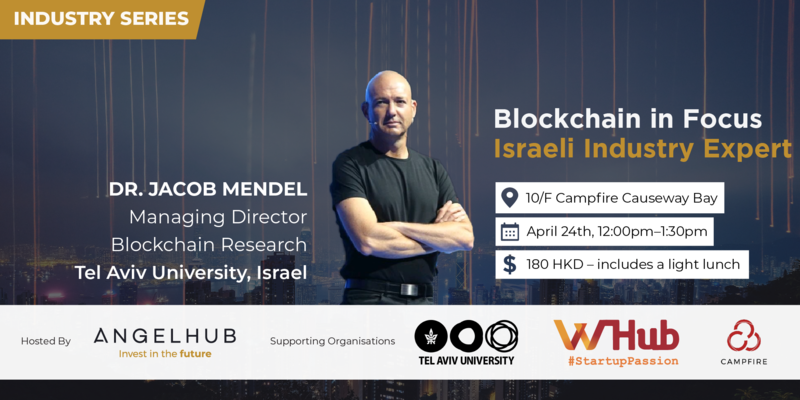 AngelHub is delighted to announce a unique opportunity to host serial cybersecurity entrepreneur and Israeli Blockchain expert, Dr Jacob Mendel, Managing Director of Blockchain Research at the Tel Aviv University, Israel. Dr Mendel will focus on Blockchain applications, trends and investment opportunities. We will also be presenting a panel of leading blockchain practitioners to give you a glimpse of the exciting practical blockchain solutions they are working on across various industries. AngelHub, HK's first SFC-licensed equity crowdfunding platform, has partnered with WHub and Tel Aviv University to bring you an opportunity to improve your blockchain knowledge and learn from industry practitioners on real-world applications beyond theory. AngelHub has invited Dr Jacob Mendel, Managing Director Blockchain Research at the Tel Aviv University, for a brief lecture on the fundamentals of the blockchain technology and how it works. He will cover some essential areas and use-cases regarding blockchain technology, like Smart City and how it's disrupting the finance industry and how it can also generate new business opportunities — understanding the new economic challenges and possibilities. The presentation cover HASH, Asymmetric Cryptography, Trusted Execution Environment (TEE), cybersecurity challenges, gaps and problems. We will also bring a panel of leading blockchain practitioners to give you a glimpse of the exciting practical blockchain solutions they are working on for different industries. Names of the panellists will be announced shortly. AngelHub is the first SFC regulated Equity Crowdfunding Platform for Professional Investors. AngelHub empowers Investors to get access in vetted startups, fuelling inspiring entrepreneurs and game changers that are revolutionising the way we live. Hong Kong's largest startup community & power connector. WHub is the best place to discover and connect with the Hong Kong startup ecosystem, from entrepreneurs to startups and more. Tel Aviv University (TAU) is Israel's largest and most comprehensive institution of higher learning. It is consistently ranked in the top 20 in the world in terms of scientific citations, and among the top 100 universities internationally. TAU shares Tel Aviv's unshakable spirit of openess and innovation.